All the Pretty Horses recounts the story of young John Grady Cole, the last in a long line of Texas ranchers. Dispossessed and in search of work, he crosses the Rio Grande into Mexico in 1949, accompanied by his pal Lacey Rawlins. The two wanderers pick up 14-year-old Jimmy Blevins, a comical but deadly sharpshooter, and encounter various adventures on their way south… where dreams are paid for in blood. 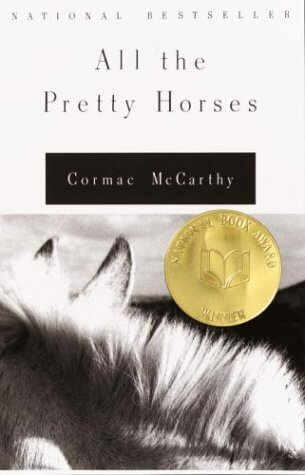 Winner of the 1992 National Book Award, All the Pretty Horses is the first installment of Cormac McCarthy’s Border Trilogy. A richly-imagined modern-day western full of adventure, romance, and vibrant characters, it served to reinforce my conviction that McCarthy is one of the greatest writers I have ever encountered in my wanderings through the pantheon of American literature. The story is simple, yet executed with energy and thoughtful finesse – it is (as another critic noted) part bildungsroman, part horse opera, and part meditation on courage and loyalty. The characters, though few, are all drawn with care and skill; and the rambunctious, heartfelt comraderie between Cole and Rawlins is both funny and deeply touching. As usual, McCarthy’s elegiac prose is nothing short of mesmerizing; through it, he not only allows the reader to stand in the characters’ shoes, he also paints a ruggedly beautiful picture of the badlands of Texas and northern Mexico. On the mesa they watched a storm that had made up to the north. At sundown a troubled light. The dark jade shapes of the lagunillas below them lay in the floor of the desert savannah like piercings through to another sky. The laminar bands of color to the west bleeding out under the hammered clouds. A sudden violetcolored hooding of the earth. I appreciated the high-spirited determination and courage of John Grady; even more laudable is his manly work ethic. In a day when young men are being raised under the false impression that society “owes” them something, I found Grady’s go-getter attitude refreshing and inspiring. Unfortunately, he’s still not an entirely good role model, primarily due to the way he pursues a forbidden relationship with his boss’s daughter, Alejandra – a relationship that involves more than one instance of pre-marital physical intimacy. Grady’s unswerving love and devotion to the girl is praise-worthy; the way in which he goes about expressing it, not so much. The violence in All the Pretty Horses is remarkably tame in comparison to some of McCarthy’s other works. There’s some gunplay (mostly non-fatal) and a knife fight and that’s pretty much it. More objectionable is the language (which is coarse and fairly frequent) and one or two scenes of sensuality (which are not particularly graphic, but still deserving of caution). Overall, I’d say the book is appropriate for most readers ages 16 and up. Quoting: More objectionable is the language (which is coarse and fairly frequent) and one or two scenes of sensuality (which are not particularly graphic, but still deserving of caution). Overall, I’d say the book is appropriate for most readers ages 16 and up. Is there *ever* a time when a scene of sensuality is appropriate for anyone, regardless of their age? I suppose what I would want to know is, are you talking about a *scene* of sensuality, portrayed in a non-sensual way (ex. the Bible’s accounting of David & Bathsheba would be like that), or is it a *sensually portrayed* scene? If it’s a sensually portrayed scene, I would argue that it’s not appropriate for *anyone* to be reading. Not that sensuality in and of itself is wrong–it’s a God-given gift, but only to be enjoyed in marriage. I don’t mean by that, that it would be OK if the 2 characters were married. What I do mean is, it’s only to be enjoyed with one’s spouse, not enjoyed vicariously by ‘watching’ someone else (ex. 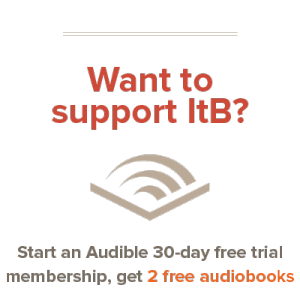 in a book), or by being ‘stirred up’ by someone other than your spouse. Any such enjoyment is illicit, and cheapens a precious gift from God. The two scenes of sensuality in the book, though still objectionable, are not described in a way calculated to “stir up” the reader, as you put it. At least, that’s not how they came across to me. McCarthy doesn’t really go into intimate detail. At any rate, the reader can see the scenes coming and gloss over them like I did, as they are quite brief. I’m not in any way excusing the inclusion of such scenes, but I do think that the good qualities of the book far outwiegh the bad, and make it worth looking into, albeit with caution and discernment. Of course, I realize that you may have a different opinion on this point, and I respect that. Nice review! This sounds like a book I would enjoy. I used to collect really old ‘rancher story’ books. 🙂 The fact is that in a book you can skip anything you are not comfortable with so I don’t mind if there’s a ‘scene’ in a book, because you can practically always see it coming and skip it. It has a good title, doesn’t it! 🙂 Thanks for the review!